Well, I am not allowed to tell you who the winners of the IYVS Project Challenge are (see blog entry below). They will be announced shortly, so stay tuned. But I can tell you that about $25,000 was raised from more than 200 donors for these student-led projects in three weeks. And this is only the beginning - IYVS tells us that they plan to replicate this on campuses around the country - and then around the world! "Let's see if anyone shows up." A couple of years ago Simon Johnson invited Mari Kuraishi and me to come talk to his class at the MIT Sloan School of Management. We awoke in Boston the morning of the class to find several feet of snow on the ground, and to hear on the radio that MIT was officially closed for the day. "Come on over anyway, and let's see if anyone shows up," said Simon. When over eighty students showed -including some not enrolled in the class - I knew that the world had changed. Even a decade before, few business school students were interested in social change. Now, whenever Mari or I speak at any of the leading business schools, the room is almost always packed. Students really care about the state of the world. And unlike previous generations, which relied heavily on protesting the current state of affairs, the current generation is taking action to actually change things. An excellent example is the International Youth Volunteer Summit (IYVS), which was formed in 2006 by two undergraduate students at Northwestern University. Their idea was to hold dialogues with young changemakers and allocate resources to the students with the most innovative ideas to change the world. Let's get this straight, because it is very significant: Students are working directly with communities in developing countries to create initiatives designed to address challenges and create wealth. Not World Bank, USAID, or other experts. Students. This year, they partnered with GlobalGiving to raise money for their projects and to enhance the likelihood those projects would be sustained over time. They have done an exceptional job, raising over $16,000 in less than three weeks for projects ranging from an initiative that connects AIDS orphans in Uganda to US artists to designing and building sustainable new water systems in Costa Rican communities to training of 300 micro-entrepreneurs in Guatemala. This is only the tip of the iceberg. The new generation will not be satisfied with complaining. They will continue to take action. And as they gain experience, confidence, and more resources, they will be a major social force acting outside of top-down, official channels. That gives us reason to be optimistic. Yesterday, Slate.com ranked GlobalGiving among the top micro-lending sites on the web. The writer, Jude Stewart, praised our "meaty" project information. And after going through our whole find--> fund--> follow process she concluded, "You can't beat that kind of accountability." I am always happy when our amazing team's hard work gets recognized. Authenticity, transparency, and accountability are what people want, and we are delivering. I was a decent economics student in grad school, but I had a dirty secret. That secret was this: At the end of an exam, I often left the room thinking "What a bunch of baloney that is." Traditional economics is based on several principles. People are in theory perfectly rational, have access to all the information they need to know, and always instantly act to maximize their own welfare. The good news is that if you make those (and other assumptions), you are able to model economics with some elegant mathematics. The bad news that people don't really act like that, and my classmates and I knew that. But most of us never dared suggest that the Emperor had no clothes. Instead, we just buckled down, learned our math, and tried to do well on the exams. I am happy to report that the field of economics is - slowly - changing to take into account the real world. Daniel Kahneman won the Nobel Prize in Economics in 2002 for his pioneering work in "behavioral economics," which builds on how people actually act rather than assuming they are perfectly "rational." 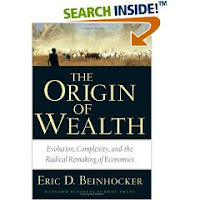 Over the past decade, another branch dubbed "complexity economics" has also begun to emerge, and I want to thank Steve Pearlstein at the Washington Post for pointing me toward an excellent summary: Eric Beinhocker's The Origin of Wealth. The subtitle is Evolution, Complexity, and the Radical Remaking of Economics. It argues that economies are actually complex, emergent systems. Economies grow (i.e., wealth is created) by an evolutionary process whereby goods and services that create value are replicated, and goods and services that create less or no value die out over time. Traditional economics is all about equilibrium - how demand and supply come into balance and how existing wealth is allocated. The traditional approach has never successfully described how growth occurs. But the new field of "complexity economics" has a coherent description of how growth comes about. 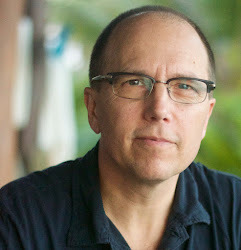 By its account, there are three key ingredients to growth: (1) PTs- physical technologies (e.g., steam engines or the internet), (2) STs- social technologies (e.g., limited liability corporations or social networking sites), and (3) a mechanism for allowing differentiation, selection, and replication of successful innovations. Much traditional thinking emphasizes the importance of new physical or social technologies as a driver of growth. But complexity economics argues that growth is tough without a mechanism for differentiation, selection, and replication. Without such a mechanism, it is hard if not impossible to stimulate and reinforce continuous innovation. One word for such a mechanism is "evolution." Another word is "marketplace." Centrally planned (non-market) economies did not have such a mechanism, and the results have been plain to see: low levels of innovation, and failure of even the rare innovation to be made widely available across the economy. By contrast, market economies (accompanied by important social technologies such as the rule of law and certain regulatory functions) have generated stunning wealth in the last 200 years. Why is this relevant to GlobalGiving? Well, to date, most efforts at international aid have been centrally planned by specialized agencies like the ones I used to work for. As a result, innovation has been slow. And not much wealth has been created out of the approximately $2 trillion spent on official aid over the past 50 years. We and others are working to create instead a real marketplace - where new physical and social technologies can differentiate themselves, be selected by funders, and be replicated widely. It is early days still, but we are making good progress by doubling in size each year. And one thing I learned back in those grad school classes is just how fast something can grow from small to big when it doubles each year.